Once upon a time, the only science fiction books you’d find in my hands were Star Wars Expanded Universe novels. I adored them. I read them as soon as I could get my grubby little paws on them, whether I used my allowance, or borrowed them from the library, or cashed in my credit at the used book store. I couldn’t get enough of the stories, because I was so enthralled at seeing what happened to Luke, Leia, Han, and everyone else after the defeat of the Empire in Return of the Jedi. I’m not sure I would’ve been able to articulate the reasons why, but back then, I was never really excited about any stories that took place between the films of the original trilogy. Not that there were many, mind you, but I realize now there was a good reason. Once the trilogy was over (and the prequels were just a distant dream), nobody really wanted to know what happened between the movies. We wanted to know what happened after. Of course, since then we’ve gotten the prequels. We’ve gotten Expanded Universe novels so far down the timeline that some readers, like myself, got tired of seeing my favorite characters manipulated by the plot into doing things that never felt true to character. And of course, since then, Disney bought Star Wars, announced a new slate of movies, and officially deemed what had been the Expanded Universe as a kind of alternate reality, divorced from any continuity from this point on. I’m okay with all of this. Around the time this happened, Del Rey had announced a series of books that would focus on individual heroes of the original trilogy and fill in the blanks between the movies called Empire & Rebellion. They also got some big names to write those stories: Martha Wells would write Leia’s, Star Wars: Razor’s Edge. James S. A. Corey would write Han’s, Honor Among Theives. And lastly, Kevin Hearne would write Luke’s, Heir to the Jedi. Of those books, Han and Leia’s were dismissed to the “Legends” line — the old Expanded Universe continuity. Luke’s got the official stamp of cannon. All of this is background, not the point of the post. I’m almost finished reading Razor’s Edge, which is Leia’s story. I became a fan of Martha Wells’ work when I discovered her Raksura trilogy, so I knew this would be a well-written tale. And it is. But there’s a problem: there is very little tension. The stakes, such as they are, matter little. And it’s not Martha Wells’ fault. 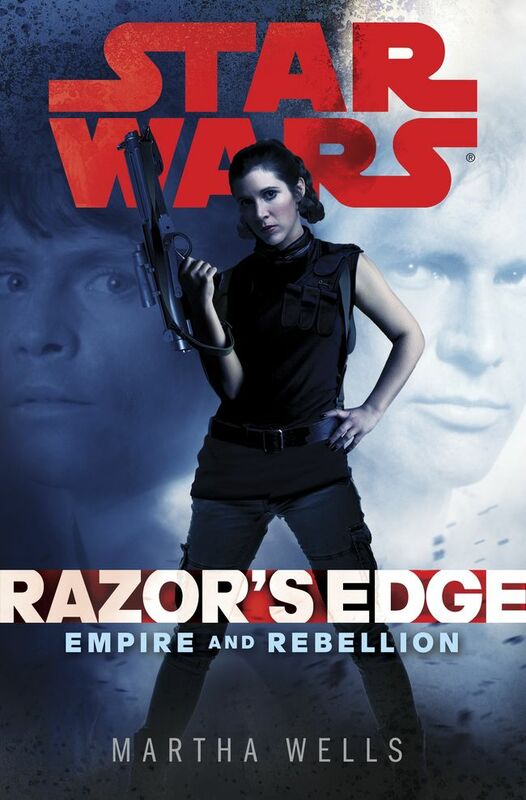 Razor’s Edge takes place between A New Hope and The Empire Strikes Back. And think about what happens in Empire: Han and Leia finally have their first kiss. Luke trains with Yoda to become a better Jedi. Han is captured by Vader & Co. and shipped off to Jabba in carbonite. So many things! But the important thing is that the characters we know and love are, you know, alive. So reading Razor’s Edge is becomes more of an obligation than an edge-of-your-seat read. The story is told primarily through Leia’s point of view, and I’ll be honest: Wells’ handling of Leia’s narrative is one of the strongest I can remember reading in a long time. One of the strongest elements of the novel is Leia handling her responsibilities to the Rebellion and how it conflicts with — no spoilers — her role as a Princess without a planet. How that conflict plays out is really interesting. However, when it comes to Leia and Han, any attempt at building romantic tension falls flat for me, because I know they won’t have their first kiss until Empire, and that made me realize that a vital part of romantic tension for me is the “Come on, get a room already!” feeling when two characters who have great chemistry haven’t hooked up yet. And I know, despite the interplay between Han and Leia in this book, that they won’t kiss, so I’m not chomping at the bit to see how their scenes alone together play out. I know, I know: Wells isn’t writing this book as a science fiction romance (though more’s the pity — Star Wars could use a good SFR), but that makes the task of creating romantic tension that just won’t be fulfilled hard as hell to pull off: it can’t be SO thick that you don’t know why they don’t actually KISS, but they can’t pretend it doesn’t exist either, because Han and Leia’s interactions are fraught with flirting, bickering, and that excellent chemistry that just begs them to either kill each other or jump into bed. And then there’s another problem: any life-threatening position Leia, Han, and Luke are placed in have all the tension of a deflated balloon. It’s watching a plot go through the motions of putting its characters in danger because that’s what you do, but I already know the ending. Not in a spoilery way either: I’ve known the fate of Han, Luke, and Leia for frakking years, so watching them try to survive life-threatening situations in a book that takes place during the original trilogy isn’t exactly exciting. I already know Han, Leia, and Luke survive. But that doesn’t mean I know how the story ends. After all, the story isn’t just about the main three. It’s about the Rebellion, the Empire, and the people on both sides of the conflict, and the people caught in between. Writing such a book must be a challenging task. I think, given whatever restraints Wells was given, she’s done a solid job. I’m sure there might have been stories that could’ve been told that would have provided the tension I was looking for, despite my knowing the basic fates of these characters. I would’ve loved seeing this story written from Metara’s POV, for example. But this was the story green-lit by the powers-that-be, and when it comes to tie-in fiction, you write what they tell you. It’ll be interesting to see if I have the same issues with Han’s story in Honor Among Thieves, or Luke’s story in Heir to the Jedi. My batting average for books in between the original trilogy hasn’t been so great, but maybe that’s me. I suspect the books that really engage me as a reader in terms of tension are going to be the exception. Those are going to be the stories that give me someone new to care about and engage with, to see how they played a part in the Empire or Rebellion. Those will be the stories that bring focus to characters who aren’t normally in the limelight. Those will be the stories that are so focus on the emotional journey and internal conflict for even the main three that I see those characters in a new way when I re-watch the movies for the billionth time. That’s what I think that’s Razor’s Edge was trying to do, and for me, the success is a mix. I hate that I’m hung up on the Leia/Han romantic tension, or the fact that I know the big three will survive whatever the book throws at it. Because there’s more at stake here than just THAT, and there are characters who are fleshing out the universe and posing interesting problems for our heroes. And that, combined with Wells’ excellent portrayal of the characters we know and love, makes the book worth reading. I just wish I wasn’t such a jaded reader. I think tension where you already know the outcome works out when there’s an unhappy ending. If you know in advance that a character dies, or turns evil, or whatever–something negative–and the story makes you wish for a different outcome, that causes tension in a way it can’t if you know everything’s going to be all right. That’s a great observation, because you want to see HOW it happens. To keep it on the Star Wars theme, we knew Anakin would become Vader, so the tension came from seeing HOW it would happen. And if the story is doing everything right, wanting a different outcome definitely creates a new form of tension!